It's the holiday season, which means I'll be joining the hordes of joyful people spreading holiday cheer through the nation's airports. Thankfully, my trusty travel companion, the DS Lite, will also be making the journey. I always get nostalgic during the holiday season, so I decided to play a game with connections to fond memories: Metroid Fusion. Despite the Metroid Prime series' outstanding accomplishments, I still think of the series as a 2D institution. It's a bit strange, since I'm not necessarily an expert on the franchise: I vaguely remember Metroid, I never played Metroid 2, but I loved Super Metroid. 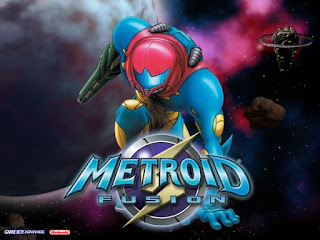 After realizing that Metroid: Fusion, came from the same development team as Super Metroid and that it bills itself as "Metroid 4," I was more than a little excited to check it out. I'm not finished yet, and I thought I'd offer some thoughts that came to me during various take-off and landing sequences. Somewhere along the line, the Metroid saga accumulated a surprisingly huge amount of lore. In my head, the game is basically a story-less shooter, but Fusion is introduced as "Metroid 4" deliberately. This is the same Samus we've known since the 1980s, and apparently her many adventures can theoretically be laid along some sort of linear narrative. At times, the plot veers into the realm of cheesy anime with overwrought dialogue and telegraphed plot twists. At this point I'm not quite sure whether I should be as confused as I am regarding all of the talk about X Parasites, Galactic Federations, and SR388s. Looking back at Metroid: Other M now, I can see that the absurd characters didn't spontaneously appear. Reading Samus' clunky dialog and puzzling through the chain of events that left Ridley cryogenic status on a space station has reminded me that, unlike the Zelda series, the Metroid chronology is openly acknowledged. So far, there's been nothing so poignant as the baby Metroid's sacrifice at the end of Super Metroid, but I appreciate the effort (or foolhardiness?) it takes to try to maintain a consistent character. Metroid Fusion feels very much like a shrunk-down version Super Metroid, but the transition was not without casualties. Most damaging is the loss of the two face buttons that happens when going from the Super Nintendo controller to the GBA. Without a dedicated button to select alternate weapons, the right shoulder button gets appropriated, which then shifts an aiming option over to the left shoulder button. The practical result is that aiming diagonally while moving becomes very difficult, since it involves using a shoulder button and the control pad to point in the correct direction. Some limitations, like the loss of a dedicated dash button, lead to logical streamlining. Instead of actively choosing to dash, Samus will automatically pick up enough speed given enough room to run. Still, running sequences are always dwarfed by shooting sequences, and even after several hours of playing, I still find myself reflexively hitting the shoulder buttons to aim and being rewarded by a ridiculously errant shot. These little control quirks are irritating, but most of my deaths were nobody's fault but my own. After all these years, Metroid still makes you earn your victories, especially against the bosses. I've seen people laud Dark Souls for similar reasons: the enemies have specific behaviors that can be exploited, but doing so requires concentration and manual dexterity. It's not enough to simply figure out how to beat an enemy, you have to execute your plan. Metroid: Fusion is creeping up on its tenth anniversary, and its structure shows how much mobile games have changed over the past decade. The game is structured exactly like a console game: you can only save at certain points on the map and any progress made must be hard-saved in order for it to count. Additionally, since it was a GBA game, closing the DS' lid does nothing to freeze the game's state. Choosing to play this game requires a level of commitment that is unheard of in today's DS/PSP/iOS landscape. Rather than conforming to your schedule, the game demands your attention by threatening your progress. Even so, I'm more than happy to give in to Metroid: Fusion's demands. It has the same emphasis on combining strategic thinking and quick reflexes that Super Metroid possessed. The environments are a bit smaller, but there are still dozens of hidden powerups and secret passageways to seek out. 2D Samus doesn't change much, but there are enough small innovations (you can hang from ledges!) to make players who left their heart in Super Metroid feel comfortable without getting bored. The game feels like visiting a friend after a long absence: they're essentially the same person, but with a couple of new quirks since you last saw them. 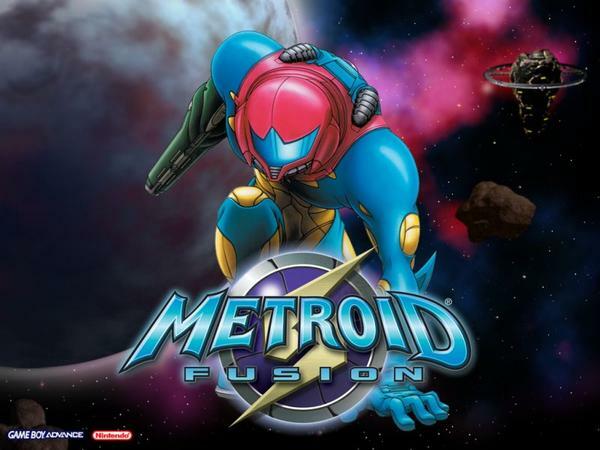 In this way, Metroid: Fusion's identity as "Metroid 4" is quite fitting. My history with the Metroid Series is kinda weird, since I started off with both Prime games and then played Fusion on the GBA as some sort of history lesson. I do have fond memories of it, at least it led me to buying a cartridge of Super Metroid which I never finshed unfortunately (got stuck on Ridley right before the end...). So thanks for reminding me that I have to plug my SNES back in at some point point to finsish this sucker! Prime 3 and Other M are also pretty high on my list when I'll eventually get a Wii. Good luck on powering through Super Metroid! If it helps, the ending sequence is pretty awesome, both mechanically and narratively. Other M's critical reception as pretty divided, which makes me even more interested in playing it. Hopefully I can get around to it soon.